Northwest K9 Bed Bug Detectives aims to be your Seattle bed bug exterminator of choice, providing you with professional and effective service to help you get rid of bed bugs in your apartment or home. Dealing with bed bugs can be frustrating and stressful, sometimes prompting us to make the wrong choice. 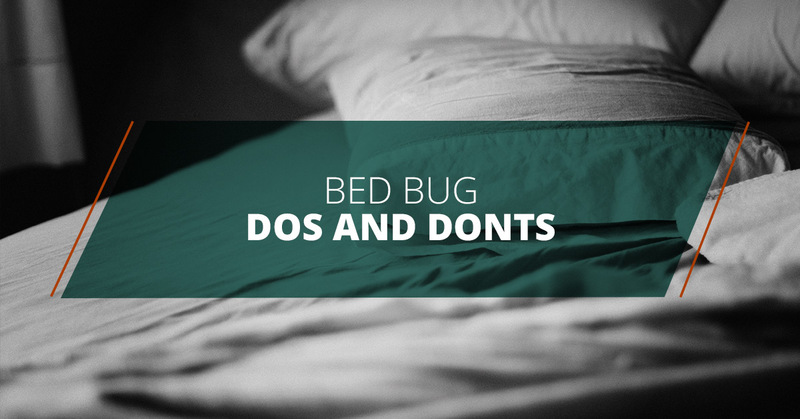 With this in mind, in this blog post, we’ll look at a few simple do’s and don’ts of bed bugs. When it comes to a bed bug infestation, the urge to solve the problem as quickly as possible is the only thing on your mind. Whether your availability prohibits it, or you’re simply unable to have a trained professional come and take care of the situation, remedying the situation immediately may not always be an option. Because of this, some people may attempt to deal with these pests on their own. While this may seem like the best possible option in the name of fixing the problem immediately, the likelihood of you being able to actually solve it on your own is relatively low. Dealing with bedbugs can be complicated, and unless you’re trained in doing so, you may end up making the problem worse. One common myth that people sometimes believe is that a bed bug infestation usually requires that we get rid of all of our belongings, especially our beds and mattresses. While many people have chosen to do this in an attempt to completely rid themselves of these unwanted pests, this isn’t necessarily the best course of action. Attempting to move your mattress out of your house can actually spread the infestation, making matters worse. Before making irrational decisions like this, it’s best to deal with the situation first. At the end of the day, the best and most effective way to deal with bed bugs is simple — hire an exterminator. Even if you’ve had the unfortunate luck of dealing with bed bugs on more than one occasion, there is no better way to handle the situation than to call a bed bug exterminator. They will be able to evaluate your situation and figure out what the best course of action is for you in getting rid of them. Beyond that, you will have the peace of mind in knowing that they’ve been taken care. Once your bed bug treatment has been completed, protecting your mattress and boxspring from future infestations is key. Getting a mattress encasement can help prevent future infestations, and in the instance that bed bugs do find their way back into your home, you will be able to spot them far earlier, making the treatment process far easier than if you were to let the infestation get worse. Whether you’ve just noticed traces of possible bed bugs, or you can confirm that your home or apartment has experienced an infestation, Northwest K9 Bed Bug Detectives is here to provide you with professional bed bug prevention services in Seattle. Our experienced technicians will be able to help you figure out all of your options, allowing you to determine which course of action best fits your home and budget. We aim to be your go-to bed bug prevention service in Seattle, and we work hard to ensure your satisfaction with the services that we provide. To learn more about our Seattle bed bug extermination company, contact Northwest K9 Bed Bug Detectives today.